ALMA image of the planet-forming disc around the young, Sun-like star TW Hydrae. The WLM galaxy on the edge of the Local Group . Artist’s view of bright spots on Ceres imaged by the Dawn spacecraft . These two galaxy clusters are part of the "Frontier Fields" project, which uses some of the world's most powerful telescopes to study these giant structures with long observations. Galaxy clusters are enormous collections of hundreds or thousands of galaxies and vast reservoirs of hot gas embedded in massive clouds of dark matter. 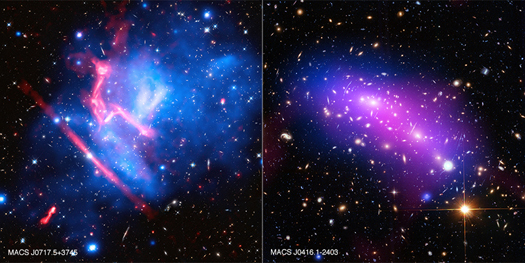 These images contain X-ray data from Chandra (blue), optical light from Hubble (red, green, and blue), and radio data from the Very Large Array (pink). The dusty ring around the aging double star IRAS 08544-4431. The sky around the star formation region RCW 106 .